Last Friday, the Chesapeake, Wheeling and Erie Railroad held its 12th operating session. It's hard to believe that the first ever session was held in April of 2012- not even two years ago. A lot has changed on the layout over that period of time, and more changes will take place in the future as the operating scheme continues to be modified based upon the comments of the crew and the additions of new equipment and staging track. During the last session, we ran two freights that originated in staging for the first time- one eastbound and one westbound. The trains originated in staging, worked various locations across the modeled portion of the layout, and then terminated in staging at the other end of the layout. In the past. there was a westbound freight that terminated at Hollister Yard in North Pierce early in the session and an eastbound that originated there toward the end of the session. Hollister Yard was never designed to originate and terminate through and way freights- only locals and mine runs. This change to the operating scheme seemed to work really well, and I'm anxious to see how it plays out over the next several sessions. 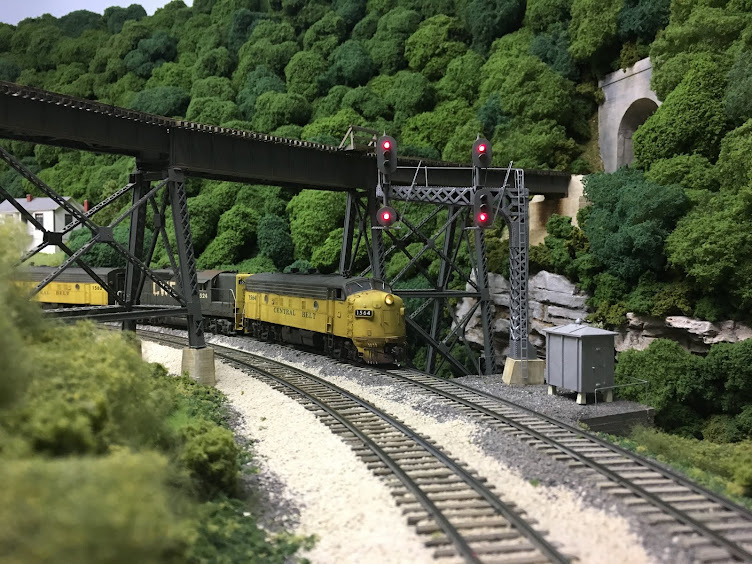 The addition of two new U30C's enabled the railroad to have the two freights originate in staging. Below is a shot of the new units headed up the 2.5% grade from Big Chimney up to Summit Springs. These units started out decorated for the L&N with headlights in the low noses. The factory paint was stripped using 91% isopropyl alcohol and they were repainted in CWE colors. Several of the regular operators on the layout who model the L&N and are die-hard fans of that line about had coronaries when they heard that I had stripped off the L&N colors. Covers were made for the nose headlights out of .005 styrene and rivets were added using Micro Mark's rivet decals. Sanding lines, speed recorder cables and wheel slip indicators were added to the trucks. New windshield wipers were also added as the factory installed wipers were glued on and couldn't be removed without destroying the parts. Lastly, bells were added to the long hoods. The photo below shows the units heading onto Bridge #40 over the main line at Big Chimney and headed toward Cedar Falls Jct. The shot below shows the steel plate over the former location of the headlight in the low nose. And lastly, we see the two units as they blast through Cedar Falls Junction on their way to Summit Springs. The Sand Fork Branch leaves the main to the left and heads across White Oak Creek Trestle. This last operating session was also the first time a special boxcar appeared in regular revenue service. The photo below show SOU 43029 on the rear of MTNM-6 as it crosses Bridge #40. This is the beautiful boxcar that Bob Zoellner built and gave to me at the last session in January. And yes, it runs as good as it looks. The U30C's still need some work with DecoderPro in order to better match the engine sounds with the speed control along with some tweaking of the low speed operation, but it's good to finally have them on the layout. And it makes me anxious to get the F-units that are in the paint shop ready for their debut. But that's a story for another day.